American landscape artists Willard Leroy Metcalf was born in Lowell, Massachusetts on July 1, 1858. He initially started as an illustrator and figure painter before his attention became focused on landscape painting. He was considered as an interpreter of the changing landscape of his beloved birthplace, New England. His art studies started in Boston at the School of the Museum of Fine Arts. He later studied at the Académie Julian in Paris. Breaking away from the Society of American Artists, he became one of the founders of the Ten American Painters in 1897, together with Edward Simmons, Joseph DeCamp, Thomas Wilmer Dewing, Edmund C. Tarbell, Frank Weston Benson, Robert Reid, John Henry Twachtman, J. Alden Weir, and Childe Hassam. They initially invited Winslow Homer to join them but he refused while Abbott Henderson Thayer changed his mind after briefly joining them. William Merritt Chase replaced Twachtman who died in 1902. Metcalf spent a few years as an instructor in the Womans Art School that was located in Cooper Union, New York. He also taught at New York’s Art Students League. He became a member of the New York American Watercolor Society in 1893. 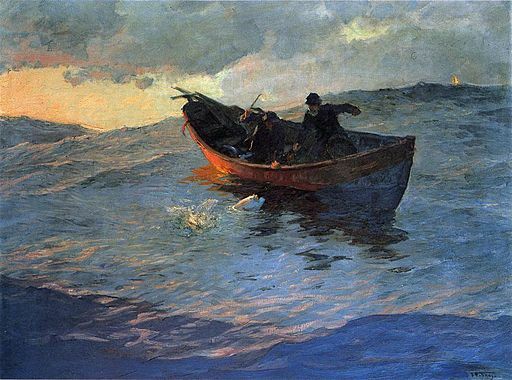 Generally, Willard Metcalf was associated with the American Impressionist movement. While he painted in different styles, he was regarded to be a natural when it comes to landscapes and he played a great role in making people view the variety of American landscapes. His style was described as direct, with no artificiality, which was very appropriate for his subjects. It was the also the characteristic that was highly valued by his peers. Metcalf began his career as a wood engraver, just like many of his contemporaries. He later became an apprentice to George Loring Brown, a notable American landscape artist, before he started taking formal lessons at the Boston Museum School. Metcalf was one of the first scholars of the said school. Like many of his peers, he earned money by being an illustrator from 1881 to 1896. He got the chance to travel to the Southwest and closely chronicled the lives of the Indians of Arizona and New Mexico, which were published in Century and Harper’s magazines. Willard Metcalf went to Paris in 1883 to continue his art studies at the Académie Julian, with Jules Joseph Lefebvre and Gustave Boulanger, who were both notable figure painters as his teachers. Metcalf absorbed the various paintings styles that were prevalent during the time he was in France, such as academic style, to Barbizon, to plein-air and Impressionism. He spent time painting at Grez-sur-Loing, Giverny and Pont Aven, with “Sunset at Grez,” “The Ten Cent Breakfast,” and “Mid-Summer Twilight” as the best examples of this work during that period in his career. It is believed that he was the first American painter to visit these areas. Willard Metcalf met many of his contemporary Impressionist painters while in France and painting near the Barbizon school area, where he was drawn to due to the reputation of Claude Monet. However, he did not follow Monet’s painting technique but allowed his subject to dictate what painting style he had to use. He developed a close relationship with Monet during his stay in France, and tutored Monet’s children in the study of flowers and birds. He returned to Boston in 1888, had a one-man show and three years later managed to establish himself in New York, earning from portrait work, teaching jobs and as an illustrator. He won the Webb Prize at the Society of American Artists’ Annual Exhibition through his painting called “Gloucester Harbor” that he painted in 1895. The group was generally devoted to American Impressionism, with Metcalf getting known for his clean-cut color and wiry brush work. He appreciated the value of natural light, plein-air painting and bright colors. He was happy when he painted outdoors and combined his being an avid fisherman to his paintings. 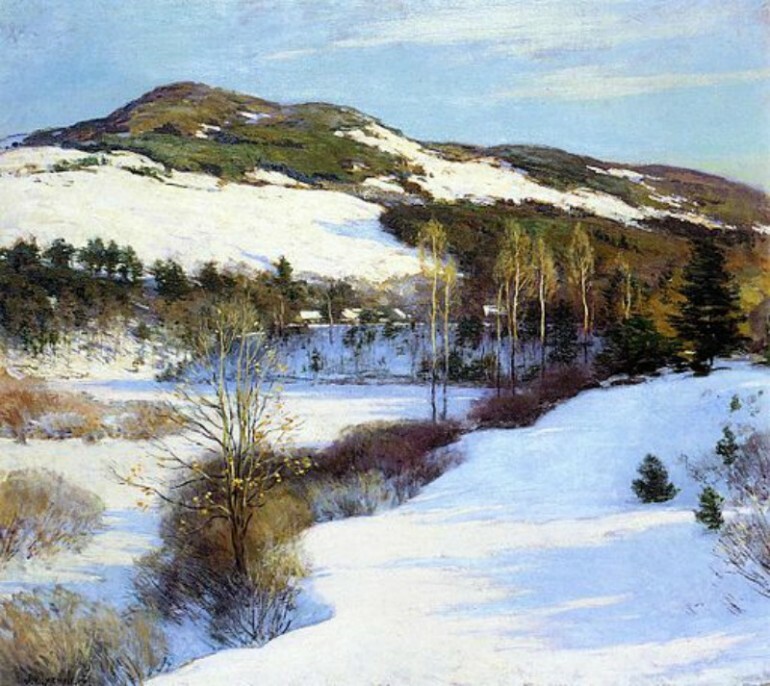 Later in his life he devoted most of his time depicting the varied landscapes of New England, showing them in all seasons, although winter was his favorite. Although Willard Metcalf developed his own Impressionist style, you could also see the influence of some of the notable French Impressionists and Realists in his paintings. There is the expansive view in his paintings that were reminiscent of the works of the dean of Impressionist painters, Camille Pissarro. You can see his love of plein air in his landscapes just like French Realist painter Jean François Millet. You can also see the dynamism in the subtle yet captivating movement of another French Realist, Julien Dupré.